Marine steam engine builder and philanthropist James P. Allaire was one of the 19th century’s most fascinating individuals. From founding a completely self-sufficient community for his Howell Iron Works employees to producing over half of the marine engines in the United States, Allaire was constantly at the forefront of innovation. Unlike most historical figures from the 1800s, though, he didn’t have an epic beard to back up his legacy. Nevertheless, his life and influence still echo to this day in big ways—but in some subtle ways as well. Here are five things you probably didn’t know about James Allaire and his company. Little is known about James Allaire’s childhood. In fact, we’re not even 100% sure if he was born in New York or Nova Scotia. We do know that he came from a well-off Huguenot family that valued academics highly. In spite of this, some sources suggest his education was elementary at best (pardon our pun). If true, this makes Allaire’s lifetime accomplishments even more impressive. It doesn’t take an Einstein to know that genius doesn’t always stem from formal education—just ask Albert Einstein. With all the new technologies brought about by the Industrial Revolution in the 18th and 19th centuries, this was a golden age for historic firsts. James Allaire threw his hat in the ring in 1818, when he began working on a marine engine to be used for the world’s first trans-Atlantic steam powered vessel—the Savannah. A year later, the steamboat sailed from Georgia to Liverpool in 29 days. Unfortunately, there were no Beatles to be found when the ship landed. This mission marked a step forward for steamboat travel and how it would be used in the future. The children of employees at the Howell Iron Works received free education at the village chapel, courtesy of Mr. Allaire. At the time, this was almost unprecedented; very few schools in the United States were free. Allaire also offered education to girls, which was rare as well. His philanthropy probably stemmed from his religious Huguenot background, which emphasizes the importance of learning. However, there was a catch to this seemingly fantastic opportunity. It was rumored that failing or rowdy children would not only be expelled, but their parents would be fired too! Who says learning math and Latin have no real-world significance? James Allaire’s influential radius spanned much farther than his Howell Iron Works in Monmouth County, New Jersey. 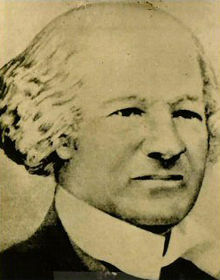 In 1833, he contributed to the construction of the first tenement buildings in New York City. This Water Street structure was designed to house one family on each floor, allowing the residence to hold more tenants. Tenements would go on to play a substantial role in urban life—especially for immigrants in the northeast. A decade after billionaire industrialist Cornelius Vanderbilt took over the Howell Iron Works in 1850, the Union Navy bought ten ships constructed with Allaire-built engines to help the war effort. The company went on to produce engines for many other US warships throughout the Civil War, helping the Union Navy become the largest fleet on the planet by 1865—and win the war. Thousands encounter James Allaire’s legacy today through a variety of year-round activities at the Historic Village at Allaire. Our historic buildings and interpreters provide guests with a unique confrontation with 19th century life. To learn more about James P. Allaire, experience his one-of-a-kind community, and interact with American lifestyle in the 1800s, come down to the village located in Howell, NJ.